This past April, Creative Carbon Scotland hosted Green Tease gatherings in Edinburgh and Glasgow to discuss the possibility of an ArtCOP in Scotland which engages with the global climate change negotiations taking place in Paris this winter. 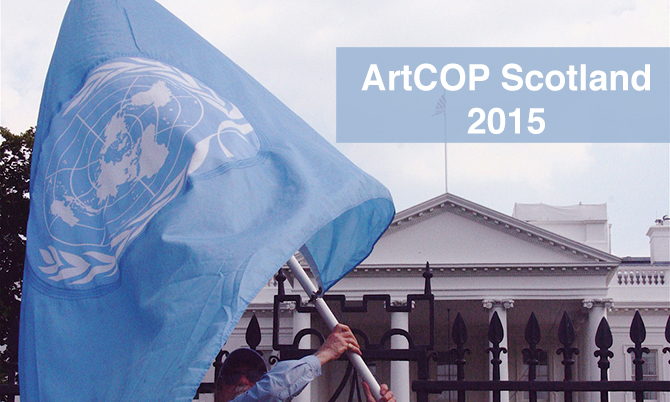 ArtCOP Scotland would provide a local response in Scotland to the UN Conference of Parties (COP21), which will happen this coming December in Paris. The COP21 meeting will bring together the world’s leaders to engage in crucial climate change negotiations. ArtCOP21 is a parallel event taking place in Paris in December where artists will use their work to raise awareness of the issues and encourage the leaders to take bold steps to protect the environment and humanity. Following the active engagement, passion and motivation demonstrated by all who were involved with Glasgow’s Green: Imagining a Sustainable City, as well as the on-going interest in the Green Tease programme, we believe that an ArtCOP Scotland could provide an exciting collective milestone for the arts and sustainability Community Of Practice (or our very own “COP”) in Scotland. ArtCOP Scotland will make use of the opportunity of COP21 to think about what roles arts and culture can play in addressing sustainability and climate change in Scotland. What we’d love is for every city, town and village in Scotland to have some form of cultural response or engagement with sustainability or climate change through grassroots and community-led activity in November and December 2015. At our first ArtCOP Scotland Green Tease meeting this past April, we asked the groups if ArtCOP Scotland would be of interest and the right direction for this community of practice to pursue, what form it might take, and what Creative Carbon Scotland’s role should be in helping to make it happen. We were very happy to receive an encouraging response, with many of the artists, venues and organisations represented at Green Tease pledging their involvement. We came away with some useful ideas on how to move forward and shape our ambitions. Our second aim is to support the development of high quality, innovative artistic work which engages with this area. We want to encourage artists to explore how they can make work in order to shift or influence our wider culture and the way we live. Creative Carbon Scotland’s role has been clarified through these gatherings, as it is clear that we will be responsible for organising, promoting and creating a hub for the ArtCOP Scotland activity. This may include an ArtCOP Scotland webpage, where participants can interact with each other and find inspiration in what others are doing. We will be setting the challenge or inviting participation from a range of creative practitioners, arts venues, community organisations and youth groups. It is clear that the invitation to participate should encourage experimentation and a variety of approaches, which in turn will show the diversity of ideas about arts and sustainability that Scotland’s cultural sector has to offer. Our April Green Tease gatherings were full of energy and important contributions to the development of ArtCOP Scotland. We will be gathering our own resources and thoughts over the next couple weeks, launching ArtCOP Scotland in the near future. If you have further ideas about how this event could take place, share them with us on Twitter @CCScotland, or come along to our next Green Tease events on 25 May (Edinburgh) and 26 May (Glasgow).